The quick couplers include: Female thread socket, Male thread socket, Socket with hose tail, Male thread plug, Female thread plug, Hose plug, etc. Before delivery, all the sockets and plugs will be strictly tested for its working pressure, air leakage. Mass flow female plug are distinguished by their high quality and durability. air is contained when the air tool is disconnected. 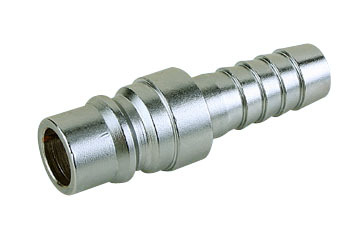 When using the coupler(s) slide back the sleeve, push in the connector and then slide back the sleeve fully to lock in the connector. Looking for ideal Quick Coupler Plug Manufacturer & supplier ? We have a wide selection at great prices to help you get creative. All the Plug With Barb are quality guaranteed. We are China Origin Factory of Plug Of Mass Flow. If you have any question, please feel free to contact us.